Sharptail Hunting Boots are crafted from premium waterproof full-grain leather and 900-denier nylon, a combination that's lightweight-yet-rugged as heck. GORE-TEX® delivers reliable waterproofing, as always, and the Danner Sharptail outsole offers solid traction that won't collect dirt and mud. Built around the TERRA FORCE® platform, they're light and stable, so you can cover more ground without that lead-boot feeling. Premier-performance, waterproof/breathable, ultra-comfortable. Just about the best money can buy, for sharptail hunting or ANY kind of active hunting. Each approx. 8" h., 26 oz. 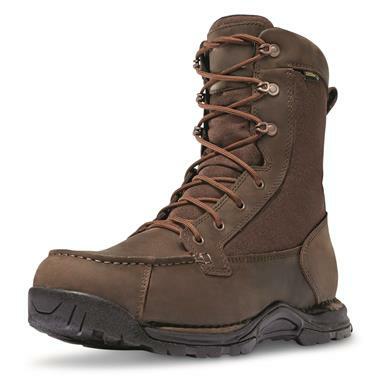 Danner Mens Sharptail 8 Lace Up Waterproof Hunting Boots is rated 5.0 out of 5 by 1. Rated 5 out of 5 by Riant from Great upland hunting boots! Bought these for a 10 day upland hunting trip in Michigan around the Au Sable River Valley in the Mio-Rollways area. Hunted 7-8 hours daily. Terrain ranged from hilly uplands to mucky lowlands to thick Aspen stands to tangled thickets. Good stuff first- 1)Light weight makes hunting all day a breeze. 2) No break in required as these boots are very comfortable from day one. 3) Waterproof-Walked in water almost to the top of the boots many times with NO leaks. 4) Traction was superb in all areas-mud, sand, side-hills, rocks, climbing over deadfalls, steep up and downhill treks. Plus the treads self-cleaned very well. 5) Ankle support was great , without being stiff. Now the Not-so-good stuff, which is minor, but annoying. A)The laces would NOT stay tied-replaced after two days. B) there is an annoying 'hard spot' in the tongue of one boot, that creates a slight pressure point/sore spot. When you're out for several hours it starts to bother you. C) this one is not about the quality of the boot, & does not affect the hunting use of these boots, but I now use them for work (since they're so comfortable) At 8", they are shorter than my old 9" Redwings, I'm not used to having a boot catch on my pants hem EVERY time I sit down & get up, walk up stairs, etc. The back of the boot slants down even lower than 8", so the pull-on strap catches on everything. But, for Upland hunting they are GREAT.